CLIP or STICK BALL ? Stick the car air freshener in the car, on your computer or in the office and it will diffuse a high quality perfume. Turn the globes of the perfume dispenser and the perfume will be diffused. It is the perfect promotional gift for in the car, in the office ,or at home. 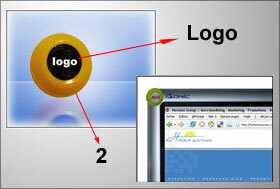 The logo, associated with the fresh perfume of the plugin airfreshener will be seen several times a day. The car air freshener can be delivered with many different perfumes. And the company logo printed on the front part will make an excellent advertising. It’s an efficient business gift and promotional item. 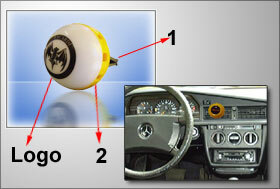 The Clipball fits firmly and easily in the aeration grid of the car. The logo printed on the front part will be seen each time your client drives his car. Turning the globes will allow him to regulate the perfume diffuser. The Clipball associates fresh perfumed air with the logo. The Stickball with it’s self adhesive backside sticks to any smooth and dry surface like the computer screen, in the kitchen or bathroom. The Stickball shows your company logo in places where other promotional items can’t. Many different perfumes available ; Tropical, Strawberry, Vanilla etc. 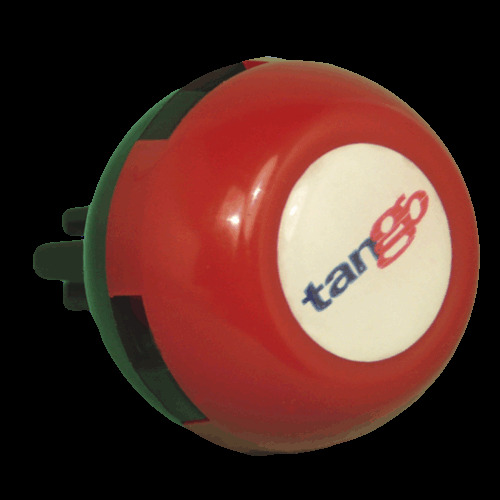 On this plug in air freshener the logo can be printed in full colour under the dome or in one or two colours directly on the plastic globe. Up from 2500 pieces you can choose the colour of the air freshener clipball. Several perfumes are available. a part from the standards we can propose for example Chocolate, coffee or ocean perfumes. 1. With its universal clip the air freshener sticks into most of the aeration grids. 2. Turn the two globes of the clipball and the perfume will be diffused. 3. The logo can be printed full colour under the resine dome. The stickball is a good room or office air freshener. Stuck to the computer screen it diffuses for example the perfume around in the working area. It's self adhesive backside allows this perfumeball to stick to any smooth surface. 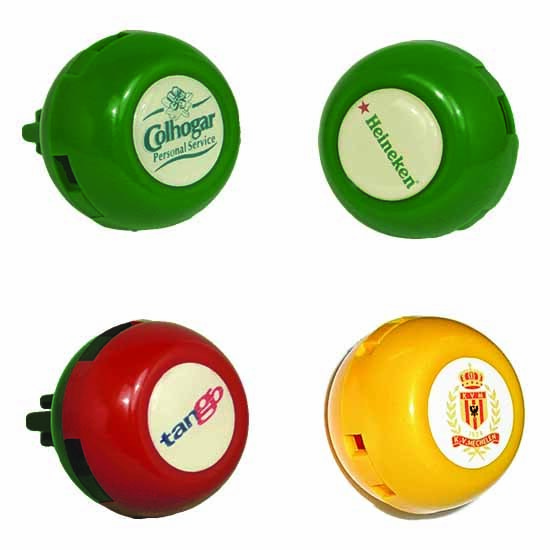 This perfume dispenser is an original and efficient promotional item for the office or the kitchen. 1. Logo in full colour under the resine dome. This freshball is excellent for colour combinations. 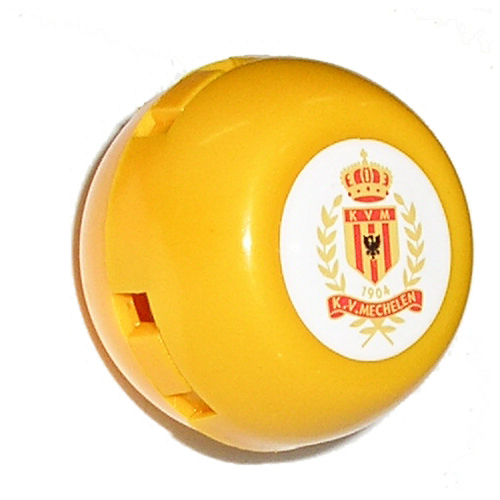 the football on the backside can be made out of two colours and you can add other colours with the rings. 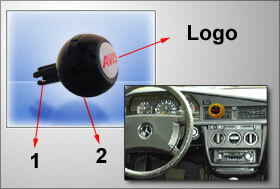 This car air freshener hangs with an elastic from the mirror and will advertise your logo in the car. Print can be done in one or two colours on the front globe. 1. Rings to regulate the airstream. 3. Logo pad printed on front globe. 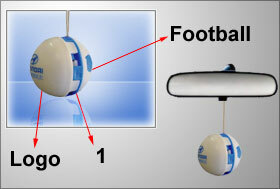 Alike the clipball the ringball sticks in the aerationgrid of the car. This aromatic air freshener can be printed up to two colours on the frontglobe. Colour combinations can be obtained with the rings and backside of this air freshener. 2. Rings to regulate the air. 3. Logo padprinted on the frontglobe. We can propose standard designs to be printed on the freshballs or we can customise them for you with a logo, design or text. Also full colour images can be printed, this is excellent for souvenir and fanclub shops..
We can propose different standard retail packagings or study with you a special retail formula. Mostly retal packagings contains more than one freshball. For prices please contact our sales departement.